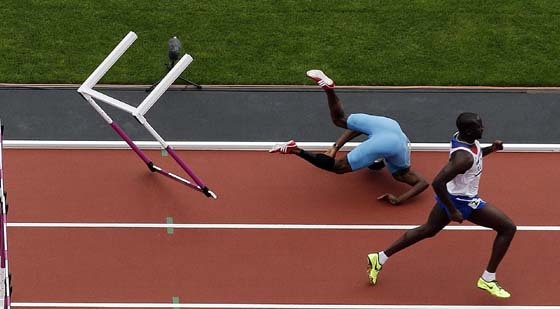 Why it's OK to Fall at the First Hurdle! Our society is riddled with perfectionism and striving for high achievement. This attitude is inculcated from a early age through our education system. At school we learn that mistakes are wrong and failure is shameful. Such attitudes are deeply engrained. No wonder most of us freeze when presented with a new challenge outside of our usual run of experience. I have to tell you - if your life is close to perfect and neatly ordered it only means one thing - you are not stretching yourself enough! Each time we take on a new and higher challenge, like a new dating partner, or a new job, we need to raise ourselves in the game of life. Most specifically we need to raise our awareness and level of courage. In life it’s important to learn to be like a champion hurdler. The collection of hurdles stretches out in front and we need to maintain our balance, relying on our fitness, heightened awareness and increased courage to see us safely jump them all. And like the wise athlete, you are unconcerned if you fall at the first hurdle. That’s because you can create a safety net of friends, family and a contingency plan to enable you to get back in the race, should you happen to lose awareness and crash over the first hurdle. It’s the presence of your safety net that allows you to brush yourself down, patch up a cut or two and go back to the start of the race and try again. There is a new philosophy coming into many leading edge companies now - it’s called fail fast. At last some businesses are beginning to realize that failure, falling at the first hurdle, can be the precursor or even the secret to success. This is because we all learn much more from failure than success. Problem solving, creativity and innovation, they have discovered, happens when people are encouraged to 'have a go,' where failure is accepted as a natural and inevitable part of the process of learning and an essential ingredient that leads to success. However this philosophy of 'fail fast' can be extended out from business into life as a whole. For example if you want to have a romantic partner, and you are not sure of the type of person who suits you, have a number of liaisons and learn from the ones that do not work. Seen in this way life becomes a big adventure. Freed of the need to succeed at every attempt and to be perfect, we can line up for the race and learn to jump hurdles by trial and error. Now you may say that this is all well and good, but failure is hard. It’s hard on my self esteem, it’s hard on my finances and it’s hard on my emotions. And this is all true. However there is one very important way to reduce the risk of failure, to soften its effects should you fail a time or two, and to rapidly learn the lessons of failure so that it does not happen too often. Can you think what it is? Here’s a clue. What does every champion hurdler have that his companions down at the local amateur athletics club have probably never bothered with? Having a professional coach allows you to fail less often and to learn quickly from those failures. Having a professional coach allows you to succeed where you might have failed. Having a professional coach allows you to run the race of your life and to enjoy the race itself as well as the winning. Can you think of any top athlete, who does not have a professional coach? How much more cool is it then to have a coach not just for athletics, but for your whole life! At Trans4mind we have a whole team of life coaches from which you can choose your favorite. All our coaches are registered with the ICF, have been carefully selected by us after an exhaustive application process and are trained by us in our company ethics and ethos and in our system of training and coaching. Our methods have received glowing testimonials from two leading Life Coaching schools in Ireland and in the USA. Are you up for a bigger LIFE? Could this be the opportunity you have been waiting for? To try out our service you can Learning about the Training and going on to do your complimentary Life Discovery session. When you do your Life Discovery session, you are presented with your training and coaching plan, just as you would be on a running track. Except this plan covers all your major life challenges. You get to choose your goal for the training and to choose the workshops that address the life challenges the assessment has shown are the most stressful for you. Then once you understand your plan and have the goal for your training and coaching clear and written down, you can take on the challenges in your life like never before and make definite progress. Then you can enjoy the race of life - and if you have trouble implementing the Concrete Step that you decided on at the end of a workshop, the coach you choose will be there to help you pick yourself up, and will empower you to clear the hurdle next time around. Does that sound like a life worth living? In 2000, after a profound spiritual awakening, Wallace wrote his book, Unfold Your Wings and Watch Life Take Off, a poetic manual that takes the hand of the reader and gently guides them toward a powerful realization of inner guidance. 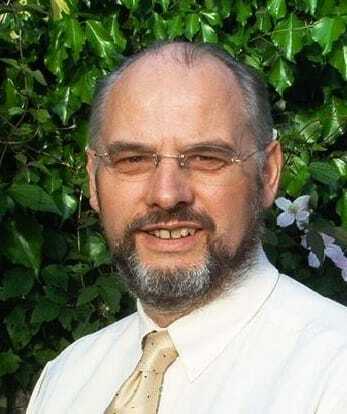 Today, Wallace is co-director of Trans4mind Ltd and is Director of Training, running the Trans4mind Personal Development Training program of interactive, online video workshops.